When I first met Joan Simpson, she reminded me of that kind of wild and fun-loving aunt everyone seems to have—laugh-out-loud funny, fashionable, and far too cool to be your mom. Simpson, along with her dear friend Maria Ortega, co-owns Sophie and Mollie’s Boutique. She had long been employed there, and about three years back made the move to buy it. After having success in their downtown Apex store, the women decided to expand to a new location a few months ago. The move was fortuitous, despite their efforts to look for quality retail spaces in Raleigh, Durham, Morrisville, and Cary. One day, a real estate agent walked into their Apex location on the hunt for some new stylish business wear. On her way out, she happened to ask Simpson if she was looking to expand, telling her that one of her retail properties had opened just two days prior in Chapel Hill. Within a week, they had sealed the deal. So, I decided to visit the boutique, as it had caught my eye before. Located next to the Courtyard and Kipos restaurant on West Franklin Street, Sophie and Mollie’s Boutique is two stories of hot-pink fashion fun. After chatting for a few minutes about her experiences, Simpson let me do some exploring. I began to get a real feel for the kind of impression she wanted the boutique to have. Mannequins were decked out in chunky jewelry and statement necklaces. Everywhere there were bold prints and bright colors. When I asked Simpson about her fashion inspiration, she discussed her admiration of the all-out glamour of the “works of art” at the Grammys and the Oscars, and this absolutely rings true in her store. With designers like Naked Zebra, FreePeople, and Judith March, the clothes are fun, daring, and stylish. For more on places to shop, dine and be entertained please use this resource: North Carolina Triangle Reviews. In my afternoon, a few items in particular caught my eye. This gorgeous tribal print chiffon maxi dress was probably my favorite item in the store—trendy, but classy enough to be worn for summers to come. When my next paycheck comes around, I will be coming back for this one. 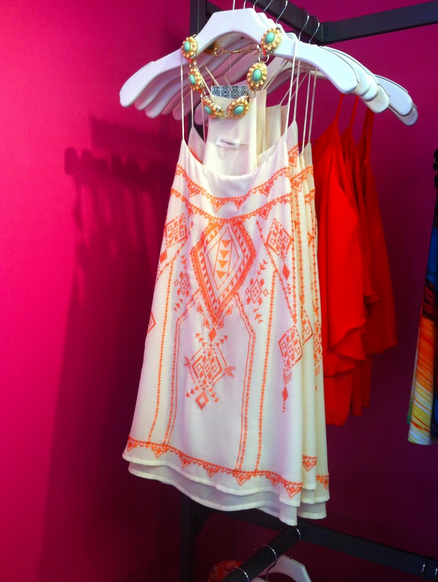 I also adored the embroidery and color of this top, even though I ended up walking out with the shirt behind it. It was a bright red chiffon Umgee top with some crochet detailing and ¾ length bell sleeves—just in time for the 4th of July too! 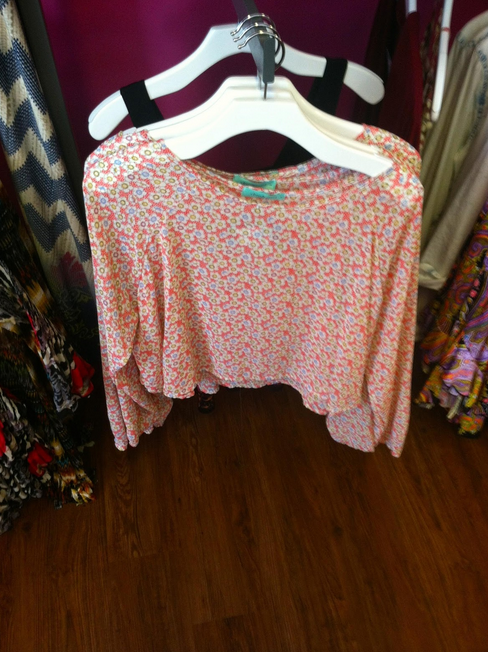 This lightweight floral crop top is perfect for summer! Dress up with white jeans or dress down with some high-waisted light denim shorts. While I enjoyed a lot of the clothes (and tried on almost ten items! ), I do have one quick caveat. Not all the inventory is meant for young fashionistas. Like I said, Joan Simpson is the fun aunt, and sometimes the fun aunt wears things that her niece would never. That being said, it is their intention that women of all ages will be able to shop together, and both find something to suit her needs. Simpson also discussed with me her love of the variety of customers that enter the store, from locals and students to visitors and parents. It might be helpful for the store to be more strategically organized, because I was turned off by the larger center display, but would have bought just about any of the tops behind it. They have a decent inventory—a great selection of jewelry and apparel, but no shoes or bags—although I did disregard a few racks of clothes geared towards a different generation. I hoped to find some flowy shorts—the ones that are so en vogue AND feel like you’re wearing pajamas—but the only similar ones were a pair of crochet shorts. Due to a lack of traffic, Simpson explained that they had moved most of the shorts back to their Apex store. One potential benefit I could see is that whatever they have in stock at their location could be easily transported to the Chapel Hill store. In other words, I don’t foresee a missing size or color causing a lot of problems. Unlike many local boutiques, they have most of their inventory online at http://www.sophieandmollies.com/, and even more photos and “coming soon” clothes on their Facebook page! I love boutiques; you get one-on-one attention from employees that not only know their stuff, but are also passionate about style. Sometimes they can be pricy, but I was able to find some reasonably priced, cute clothes. The dressing rooms were spacious, but I was a little bit irked that they didn’t have a mirror inside—just a massive one behind the cash register, next to the dressing rooms. Because I was trying on several tops, and didn’t have bottoms to pair with each of them, I would have preferred have a mirror inside of the dressing room. As a music fanatic, I always notice what type of tunes stores and restaurants are playing. She mostly played pop music, but it wasn’t overwhelming or distracting, just something fun to sing along to in the background. Simpson made me feel very at home, helped me find jewelry to pair with outfits, and even gave me a discount. I can tell these women value customer loyalty, and even discussed the potential for a frequent buyer’s card. With a daughter of her own and a degree in fashion merchandising, it’s clear that Simpson knows what she is talking about, and is truly there to give women a great shopping experience. One difference from other boutiques that I noticed is that they have a lot of fashion photography—their clothes, of course—in nice frames, on the walls, and in the dressing rooms. This made me feel a little more at home, particularly because Simpson does the vast majority of the photography and uses customers, friends, and daughters for models! Just like the variety in their store, they utilize a variety of models as well, which I found refreshing. Have some family in town and want to do some shopping? Take them here; they may help you foot the bill, and find a few items of their own! Sophie and Mollie’s is a fun shopping experience and worth your time, as they carry many of the latest trends, along with some unexpected and bold pieces. I expect good things from this store, as they begin to learn their clientele and they adjust to the influx of students in the fall. This is a business that would do well to build out a Pinterest presence. This is a resource to get that up and going: How to Get Started on Pinterest for Business. We will have much more information on fashion and shopping in the Raleigh, Durham and Chapel Hill area so stay tuned.